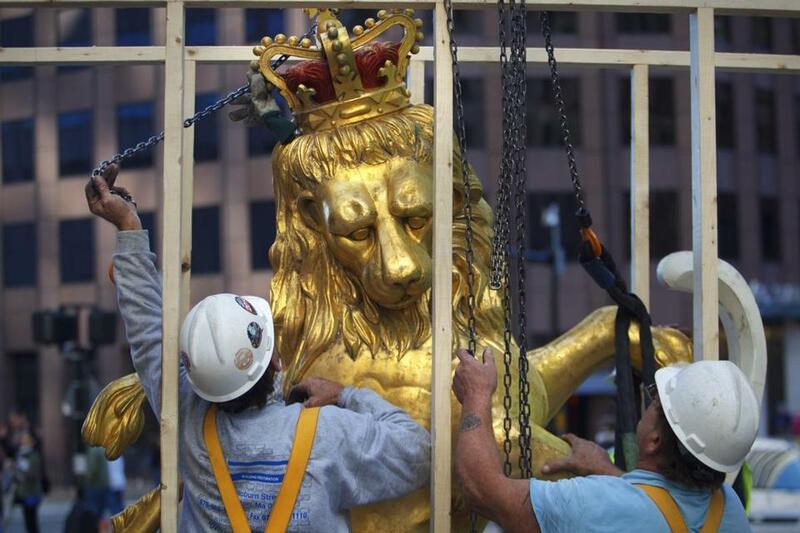 Sculptor Robert Shure of Skylight Studios in Woburn, who is in charge of restoring the lion and unicorn statues from the Old State House, found the time capsule Monday, said Heather Leet, spokeswoman for the Bostonian Society. The statues were taken down Sunday for restoration. “We [the Bostonian Society] didn’t know about the Globe article until several years ago,” Leet said. 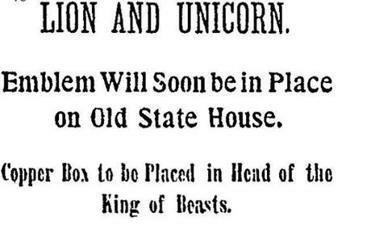 The article detailed some of the items that were placed in a copper box inside the lion statue on the State House. The items found in the capsule will be added to the society’s collection and displayed this fall in the Old State House museum, Leet said. The exact dates that the capsule items will go on display depends on their condition and how long they take to process. Before the restored statues are returned to the building, Leet said, a new time capsule will be placed inside for 22d-century Boston. Inside will be facsimiles of the 1901 contents and a photo of Mayor Martin J. Walsh, she said, but the society is asking the public for more ideas. Ideas can be sent to the Bostonian Society via Facebook, Twitter, or e-mail, and should use the hashtag #LionAndUnicorn.